Buried in Bob Iannucci’s discussion at Supernova 2008 last week was this comment: “Connecting people only through voice communications is limited,” the Nokia chief technical officer said. To me, that sums up everything Nokia is doing, including today’s announcement. Nokia, the world’s largest handset manufacturer, is purchasing Plazes, the location-based social networking service that’s based in Berlin with all of 13 employees. Updates can be done via plazes.com, by mobile phone and text messaging, or by a number of third-party applications using the Plazes’ API. 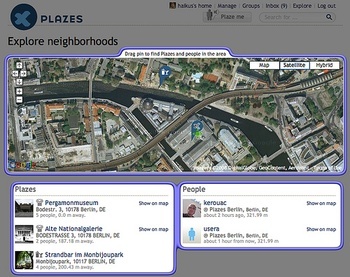 And, we can expect, Plazes will be on millions of Nokia phones worldwide as soon as possible. With Plazes and other recent acquisitions, Nokia is clearly connecting people through location-based services, maps, music communities, gaming, and — almost forgot — voice. In 2006 Nokia purchased a mobile mapping company Gate5, also based in Berlin. Nokia followed that with the intent to buy Navteq, the world’s largest data mapping company. That $8 billion deal is expected to be completed soon. Other social networking and media companies purchased by Nokia include Twango, Enpocket, and Loudeye. Nokia is busy with its own service development as well, including desktop-mobile portal Ovi, the Comes With Music initiative, an online music store, and the N-Gage gaming effort. Imagine everything Nokia offers wrapped in a cuddly location-based, mapping, social network cloth where all of its users are connected to their interests and each other in the virtual and physical worlds at the same time. “There is value beyond voice,” Iannucci said. As we are witnessing, many companies, large and small, believe in “value beyond voice,” including Google and its many initiatives, Apple and the iPhone, third-party Android and iPhone developers, the network carriers. My question for Nokia is: What are you going to do with the opportunity you have? Is Plazes going to be available only for Nokia owners and subscribers? Or will Plazes, which is supposed to release a native iPhone client next month, going to be available for as many phones on as many carriers as possible? Platform exclusivity works against the network effect, which defines social network and social media. No location-based social network will succeed among the masses if it is limited to friends who use a particular handset or platform. We don’t need more “walled gardens.” The rollout of location-based services will be messy and confusing enough for consumers, with lots of hardware options, services, carrier involvement, and players like Google, Apple, and Nokia vying for your attention and money.